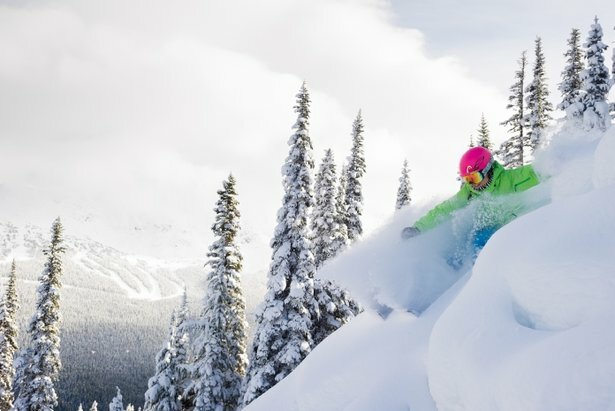 Tomer's Take: On Friday ski Whistler/Blackcomb or Banff, on Saturday ski Loveland, Winter Park or Arapahoe Basin and on Sunday ski Taos or Whistler/Blackcomb. The overall pattern turns quieter over the next five days. The conveyor belt of storm systems in the Pacific Northwest slows down and that limits the snowfall throughout the Intermountain West. In the Northeast, it looks colder with a couple chances for snow showers. We're still in El Nino watch. There's a 90 percent chance of El Nino developing but it hasn't happened yet. And, the sea surface temperatures in the equatorial South Pacific have actually cooled slightly since December 2018. Achieving a full-blown El Nino at this point might be difficult. Heavy mountain snow gradually winds down on Thursday. A storm system stalls off the coast between Sunday-Tuesday. It could send a couple waves of snow into the Cascades, Volcanoes and Olympics. Snow winds down on Thursday. A storm system stalls off the coast of Washington and Oregon until possibly Tuesday, so it stays dry until then. Heavy snow continues on Thursday with on/off snow on Friday. Light to moderate snow comes back on Saturday then turns lighter on Sunday. Light snow returns on Monday. It might be hard to time these waves of snow with the storm systems stalled off the coast. Snow winds down on Thursday morning. Thursday should be a good ski day at Tahoe and Mammoth. The pattern dries out until possibly Saturday. But, this storm is uncertain and could stall. Another chance of snow arrives between Sunday night and Monday. Heavy snow is possible Tuesday-Wednesday. A wave of light snow could dust the Wasatch on Thursday arriving in Colorado possibly on Friday. This wave could stall over parts of Colorado into Friday night. Amounts stay light. It could stay dry Saturday, Sunday and Monday with new snow arriving Tuesday. 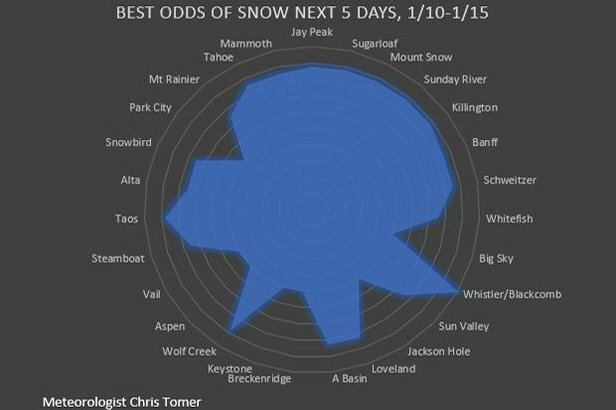 Ski Resorts with the best chances for snow through this weekend, 1.10.2019. A wave of light snow rolls through on Thursday. Then it could stay dry until Tuesday. A wave of light snow is possible Friday night into Saturday morning. Confidence is low. Another wave of snow is possible on Sunday. Colder with snow showers on Thursday. Great skiing on Thursday and Friday at Jay Peak, Killington, Sunday River, Sugarbush, Mount Snow and Wildcat. There's a slight chance to get brushed by light snow on Sunday and Monday-Tuesday. 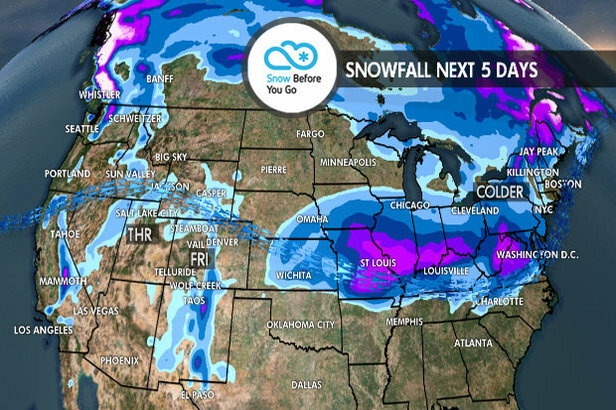 Want the Snow Before You Go weekly weather forecast delivered to your inbox every week?